In modern society the service industry has took main role in advanced countries and the service innovation, how to design to improve productivity of the service, become a major issue in the business world. The service has four features as intangible, concurrency, heterogeneity, and extinction, then the service design process and perspective are considered to be different from the product design in the industrial age. When we build the service business, we should think about service elements such as a service receiver, a service provider, field of services, and time axis, in comprehensive viewpoint. In the service industry, we have to provide the service to satisfy customers, but it is necessary to understand the varying needs of different customers. Traditionally this process is relied on the ability of the person providing the service. The improvement of the service productivity was depends on the individual’s tacit knowledge in the large part, there are also limits of human ability, then it is difficult to generalize. On the other hand, modern Web services that are provided through the internet, information processing technology could be speculated the information needs of users through the human computer interaction, it has become possible to improve the service productivity. 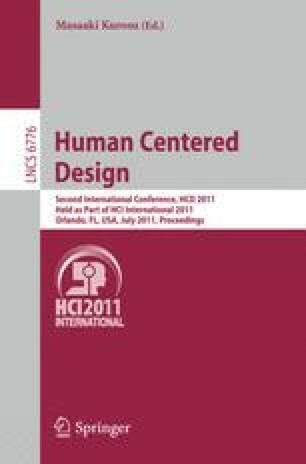 In this paper, in order to achieve improved the service productivity by information technology services, and we considered how to embody changeable user desires as explicit knowledge using the human-centered design techniques. As a concrete methodology, in order to systematically understand the varying needs of users, is considered to be a ethnography and contextual inquiry method, as output in order to incorporate the inference engine need to be written as a structured form. As for the psychological needs of users, I think it is appropriate to consider developing a persona, the issue is a how to build a appropriate emotional model. What may be modeled using the technique of human-centered design to the desire for services that change these users, such as shops electrons on the current Internet, analyze the user’s preferences, select the information that may be of interest for each user show to take a case recommendation service system, and consider.